At the annual Washington gathering of the Christian right sponsored by the political arm of the Family Research Council, the Republican Party’s emissaries have come in past years to bow before some 2000 right-wing foot-soldiers and the leaders who command them. However, this year’s Values Voter Summit, a bit light on GOP dignitaries, made less news for its speaker line-up than it did for the sale of a breakfast food. In a statement David Nammo, the executive director of Family Research Council Action, said that his organization demanded the exhibitors dismantle their display “when the content of the materials was brought to the attention of FRC Action senior officials” on Saturday. 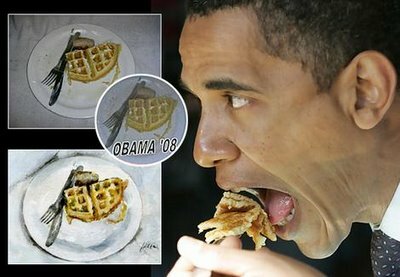 But by the time Obama Waffles creators W. Mark Whitlock and Bob DeMoss began breaking down their display, the conference was winding down and most exhibitors had already left. While Nammo condemned the display as “an attempt at parody that crosses the line into coarseness and bias,” the truth is that Tony Perkins, president of the Family Research Council, a spin-off of James Dobson’s Focus on the Family empire, has on at least one occasion hobnobbed with white supremacists. And if the conference organizers were unaware of what Whitlock and DeMoss were selling for two and a half days before the exhibit was shuttered, as they claim, then they were certainly well acquainted with the men behind Obama Waffles, both of whom have long ties to the leaders of the religious right. According to a letter of reference written by DeMoss on behalf of Whitlock, the two men met while working for Focus on the Family, where Whitlock served as a producer on Dobson’s “Focus on the Family” daily radio program from 1991 to 1992, according his resume. DeMoss, Whitlock’s partner in the waffle venture, also has some friends in high places within the religious right, having served as the co-author of books with Tim LaHaye, best known as the author of the Left Behind book series. With LaHaye, DeMoss penned four novels targeted at young adults that include a cautionary tale about an evil abortion doctor. The story centers on a missing teen whose absence is only noticed days after he vanished because his household is headed by a single mom who spends long hours at work. LaHaye, DeMoss’ co-author, is one of the top leaders of the religious right and a co-founder of the Council for National Policy, the super-secret umbrella group that reportedly vetted GOP vice presidential nominee Sarah Palin on the eve of the Republican National Convention. More recently, while reporting for Church & State magazine, I saw Perkins address a crowd of Christian right believers in 2007 at the Fort Lauderdale, Florida-based Coral Ridge Presbyterian Church of the late Rev. D. James Kennedy. Delivering a speech in the church sanctuary at the “Reclaiming America for Christ” conference, Perkins referenced the biblical story of Phinehas, oft-cited by white supremacists to justify their beliefs. In this instance, Perkins invoked the story while making the case against Muslims, urging the assembled Christians to “take action” in the way Phinehas did. “I am here advocating for Christian citizenship,” Perkins said. Lest any of the assembled miss the point, Perkins offered up the story of Phinehas, grandson of Moses’ brother Aaron, from Numbers 25. Phinehas was rewarded by God with an “everlasting priesthood” for killing an Israelite and his Midian lover because God had forbidden the mixing of the men of Israel with the women of that tribe. “We read that Phinehas arose and he took action…,” Perkins said. Just in case his message should be misconstrued, however, Perkins offered this caveat: “Now, let me be clear, in case the media’s here,” he said, “I’m not advocating you go home and get a pitchfork out of your storage shed and run into your neighbor’s house.” Phinehas, the Bible tells us, used a javelin. Maybe the organizers of the Values Voter Summit, as David Nammo’s statement suggests, did simply get sloppy and failed to block a product that sold like hot cakes before they intervened. But, as it turned out, racist supply met racist demand at the conference. Perhaps the FRC honchos should wonder why that was. I’m no Obama fan considering his obsequious treatment of Wall At. fraudsters, but this article spells out just how imbecilic the reactionaries really are. Instead of attacking his failed policies and his loyalty to High Finance at the expense of the American people, the GOP will instead revert to racist form. Now, on to see which moron will take on Obama in 2012, will it be kook Michele Bachman or Wall St. crook Romney?